Her daddy died in the line of duty three (3) days before her kindergarten graduation. A big loss for a little girl. 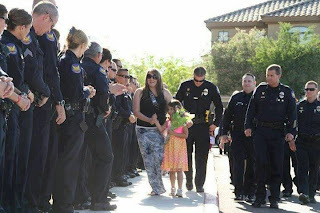 On the day of her graduation, three hundred (300) amazing police officers gave the little girl a pleasant surprise by showing up. It's really touching, what these officers did. Going out of their way to make the girl and her mum feel loved. It won't bring her dad back,but it was a beautiful and selfless act. The most beautiful act I have seen in a long while. I'm sure this act went a long way. It's hard to get closure so soon after a loved one is gone, but some things make the burden light by tons.